Saturday, was Shuttlebirds first Fall Lace Day. It was a great day of tatting, learning and laughing with friends. 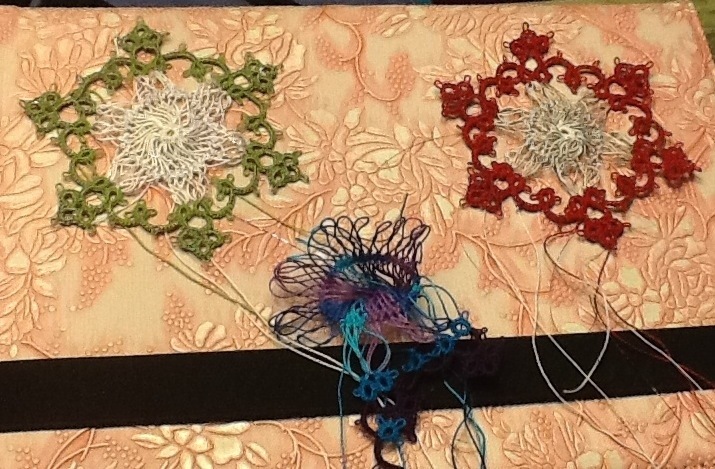 In the morning, Patty Marley taught us how to make the tatted and hairpin lace snowflakes. In the picture below, the blue one is how badly my first one came out. The green and red ones I made today . After lunch (good eats just like at workshop) Jan Barwick taught us the basics of pearl tatting and encapsulation. There was no specific pattern, but rather a few hours of Jan walking around helping us work different configuration. I don’t have anything cool to show you yet but Natalie was working on a pretty beaded bracelet. I am sure she will post pictures too, hint hint hint. The green is white (20) and Lizbeth Medium Leaf Green (20) with some pinkish Sulky Holoshimmer #145-6043. The red is white (80) and Lizbeth Christmas Red with a rainbow Sulky Holoshimmer #145-6045.